Paper Temptress - Wonderful Wednesday Giveaway! If you are a paper-lover -- and I suspect you are, because most of us who stamp love the paper as much as anything else -- you are going to LOVE the paper I have the honor of giving away this week! Today's giveaway sponsor is The Paper Temptress. The giveaway is for a pack of 50 of the most luscious, luxurious papers that you have ever seen ( at least a $29.00 value)! This is a paper quality that must be caressed, must be adored -- must be used. Tonight, Wednesday night the 25th, there will be over 50 new sheets of cardstock added -- the same ones you will receive as the giveaway winner. Some of them will change the way you stamp and design. There will be a party at PaperTemptress' PaperLovers group located at PaperCraftPlanet where several fabulous designers from PaperTemptress' design team will be spotlighting the new "Lustre" line and all of the new cardstock. Lots of colors, textures, and touches! And one lucky winner of the giveaway today will receive all of the new paper in a package directly from the Paper Temptress. They are so new, we don't even have a picture yet! The card shown above uses the Paper Temptress Silver Lustre Swirl Cardstock -- one of the many beautiful papers you will receive in your package. As you can see with the close-up on the right, the ink just floats on this paper -- and coloring it is a dream! The image I stamped is from Two Nancy's Art Stamps (Don't forget you get a 10% discount there, too with this code: twonancysTJ9/6) from the Fantasy Women, Plate 1 Sheet of stamps. To show off this gorgeous paper (and the gorgeous stamps), I used the Pierced Spotlight Technique from the February 2009 issue of the Technique Junkie Newsletter. 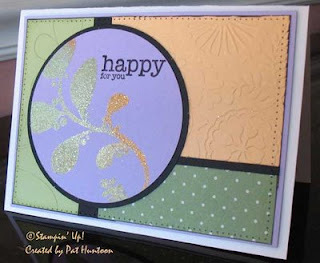 To enter the give away for the Paper Temptress Paper and the card shown above, simply leave a comment on this blog entry telling me that you would like to enter by 11:59pm EST on Sunday, March 1st. No other entry methods will be included in the give away. If you email me to enter, your entry will NOT be considered a valid entry. When you leave the comment, make sure to put your NAME in the comment -- if you enter your comment as "Anonymous" - or you just enter with your first name, I cannot give you the prize! Blogger does NOT record your email address for me, so you will need to check back to find out if you have won or include your email address in your comment so that I can notify you. A good way to do this is like so: phuntoon at optonline dot net -- it will help protect your privacy! I will have a random number generator pick one number from the comments to select one winner. Each give-away is separate, so to be eligible for a specific item you must enter that day's contest on the post where it is listed. Enter today -- good luck! The winner of this giveaway is Melissa Banian -- congrats, Melissa! Today's card is for Technostamper Sketch Challenge #58 (the sketch is below). My card features the Block Collage Technique from the February issue of the Technique Junkie Newsletter on the main panel using the "Walk a Mile" full sheet from the Stampinback line by I Brake for Stamps. I love how this card turned out! I was going to do something totally different for this challenge, but these stamps just kind of jumped into my hands. You see, I was looking for these very stamps to make ATCs with last week. I was in a swap this month with a "Hollywood/Glamour" theme... I knew I had these stamps, and had something really cool planned...and then I couldn't find them. My stamp room just swallowed them up! This morning, though, I was back to stamping, and wouldn't you know they were right there. Just right in front of me! So I figured I better use them for this before they are swallowed again. Hmm, maybe I should put them away in the right place??? In any case, Happy Birthday, Mary Jo -- and to my son Alex, too. I think what I like the most about this technique is the subtle variations of color that are achieved with the brayer. It is hard to tell in the picture, but can you see the fade from rust to orange to rust to burgundy? It is really pretty IRL. I don't like to do this normally, but I have two things to post along with today's card. This card uses the Duotone Resist Technique from the February 2009 issue of the Technique Junkie Newsletter as a background. The stamps are from Innovative Stamp Creations. Enjoy! 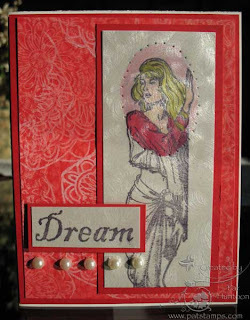 Wonderful Wednesday Giveaway - Firecracker Designs by Pamela! What is more elegant than a swan? Today's giveaway is this gorgeous swan set from Firecracker Designs by Pamela called "Bummed Out". 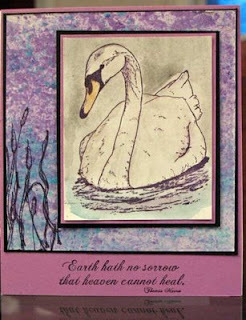 This is features the pretty swan shown in the card above, plus 3 other swans, plus reeds and sea grass, and a poem, too. I chose to make a card from it that uses the main swan and the reeds layered over a piece of Pigment Scrunch, a technique found in the February 2009 issue of the Technique Junkie Newsletter. I colored my swan panel using Shimmerz -- I love the gently shimmer on the swan. There is a picture on the right so that you can see it better. The stamps made by Firecracker Designs by Pamela are always of the highest quality -- and YOU can receive 10% off your order, too, by placing using the discount code TJSROCK with your online or phone order. 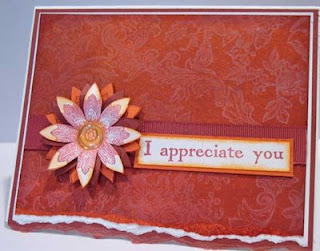 To enter the give away for the Firecracker Designs by Pamela rubber stamp sheet and the card shown above, simply leave a comment on this blog entry telling me that you would like to enter by 11:59pm EST on Sunday, February 22nd. No other entry methods will be included in the give away. If you email me to enter, your entry will NOT be considered a valid entry. When you leave the comment, make sure to put your NAME in the comment -- if you enter your comment as "Anonymous", I cannot give you the prize! Blogger does NOT record your email address for me, so you will need to check back to find out if you have won or include your email address in your comment so that I can notify you. A good way to do this is like so: phuntoon at optonline dot net -- it will help protect your privacy! I will have a random number generator pick one number from the comments to select one winner. Each give-away is separate, so to be eligible for a specific item you must enter that day's contest on the post where it is listed. Enter today -- good luck! The winner of this giveaway was Jeanne Johannes! Congrats, Jeanne! Today's card is just for fun! 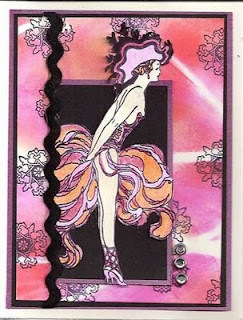 This card uses the Stringing you Along technique from the February 209 issue of the Technique Junkie Newsletter. 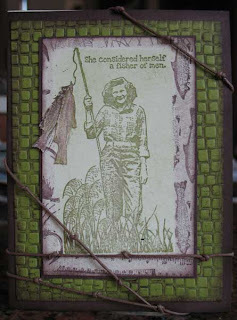 The images are from Two Nancy's Art Stamps. I just love this image -- can't you just see the motion in it? In any case, if you are interested, you can use this code for 10% off on the Two Nancy's website: twonancysTJ9/6 . I haven't had the opportunity to play along with the Technostamper Sketch Challenge for weeks now. I am pleased to be a part of it today, albeit a little late in the day! I love this sketch. It was open to so many possibilities! I decided to work outside my comfort zone with the palette I used today, too. I am always more comfortable with muted tones, not so much on the subtle side. This apricot color is one that I rarely use. Since my focal point uses the Faux Leafing Technique from the February 2009 issue of the Technique Junkie Newsletter, and the faux leafing mimics the apricot color so nicely, how could I NOT use it? 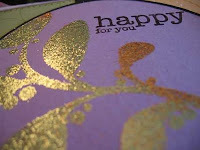 I love the look of this technique -- so much like gold leafing (and cheaper and easier, too!). A close-up of the Faux Leafing is on the right. Have you tried this technique yet? 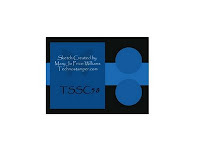 Go to Mary Jo's site to see the other players and the sketch, too, if you would like to play along. Hope your Monday is happy! I have One True Love. My husband. He is the most adoring, caring, loving person in the world. We still have chemistry after 21 years of marriage. He still makes my toes curl. This is his Valentine. His real Valentine. The one that professes my love. The card is a combination of techniques and background papers. Since he is an artist, I know he loves texture, so I made sure there was plenty of that, too. The brown colored portion on the green textured layer uses the Background Burst Technique from the February 2008 issue of the Technique Junkie Newsletter. The stamp used there is from Stampin' Up!. The green layer and the layer that says "One true love" are both background papers. The heart is a cuttlebug heart/die cut that I treated with the Cuttlebug Highlights technique from the October 2008 issue of the TJ Newsletter. Now, off to spend my day with my love! Today's Blogger's Challenge was a themed challenge: Valentines. Not so hard for the day before! Since I have two teen-aged sons, I chose to make Valentine cards that "spoke" to them. Nothing says "I Love You"more than skulls with eyes for hearts and telling them that they ROCK. The top card is for my 15 year old (who is a bit indifferent to the art of stamping - hence only glitter on the skull eyes, and Crystal effects on the teeth). My 13 year old appreciates the finer side of stamping, so his card has texture from the Cuttlebug, a full glittery skull, and Crystal Effects on the teeth. 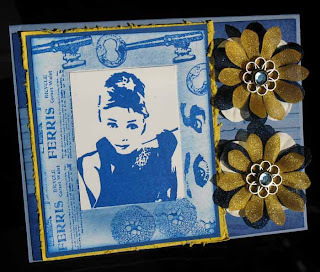 Both cards were made using the Triple Play Technique from the February 2009 issue of the Technique Junkie Newsletter. (yes, there is a third card -um, from the triple part), but that is for later this week -- I thought you might be sick of my Triple Play cards this week! 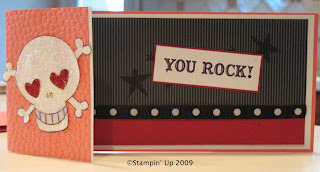 All stamps: Stampin' Up! Just Jawing. Hope your pre-Valentine's Day is filled with LOVE! 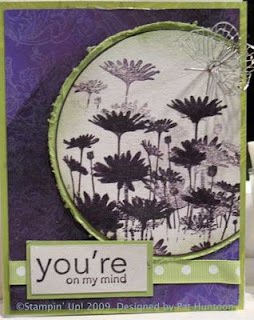 I just love this plate of stamps from Artistic Outpost. They are so vintage-chic -- and the sayings are all so much fun, too! This is one of the Valentines for my honey (yes, this is my funny one). I think I will put this in his lunch on Friday morning so that he knows I am thinking of him. That way I can give him a romantic Valentine Saturday! 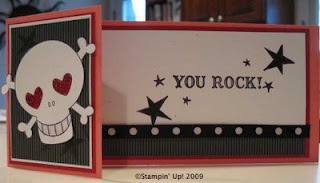 If you missed it, this stamps sheet is the one I am giving away in THIS POST. Enter to win it! My card was made using the Block Collage Technique (from the February 2009 issue of the Technique Junkie Newsletter). After I made the collage, I decided to cut it down quite a bit -- I wanted a frame effect. I layered that on chocolate chip cardstock, and that was layered on a piece of textured olive paper I made using the Cuttlebug Smoosh Technique (from the October 2007 issue of the Technique Junkie Newsletter). Oh, the fish on the line are cut out and popped, too, and I painted them with Shimmerz paints. Another TJ Vendor, Clear Artistic Stamps, has them in stock right now, AND TJ members receive a 15% discount! Sorry I didn't get a better shot of them. Did you know that the newsletter is only $16.95 per year right now? The special pricing is only good for a few more weeks, so if you have been considering subscribing, do it now!! And yes, the pricing is also good for renewals, too. Please email me for details or if you would like an invoice from PayPal. Wonderful Wednesday Giveaway - Artistic Outpost! 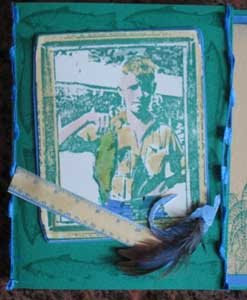 There are alot of pictures in this post -- just a little warning...I did it so that the questions about the flap for the Triple Play Technique (February 2008 Technique Junkie Newsletter) could be answered visually. I think the pictures will help! 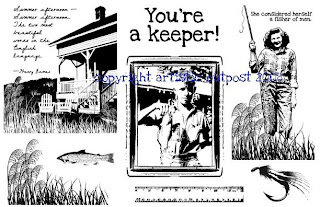 The giveaway today is for these really cool Artistic Outpost stamps called "Keeper" (below). This fun plate is in the vintage-chic style that AO is known for. I am always thrilled with the variety, intelligence and wit that is the trademark style of Artistic Outpost! 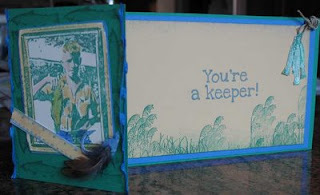 I love the sayings on this one -- and the "You're a keeper" makes this just right for card-giving for the boys in our lives. Make sure to visit the AO site -- and tell Robyn you we sent ya! I think my favorite parts of this card are the fishing lure on the front panel (with my feather) and the string of fish in the corner. I hope the lucky winner of the giveaway likes it too! To enter the give away for the Artistic Outpost rubber stamp sheet and the card shown above, simply leave a comment on this blog entry telling me that you would like to enter by 11:59pm EST on Sunday, February 15th. No other entry methods will be included in the give away. If you email me to enter, your entry will NOT be considered a valid entry. When you leave the comment, make sure to put your NAME in the comment -- if you enter your comment as "Anonymous", I cannot give you the prize! Blogger does NOT record your email address for me, so you will need to check back to find out if you have won or include your email address in your comment so that I can notify you. A good way to do this is like so: phuntoon at optonline dot net -- it will help protect your privacy! I will have a random number generator pick one number from the comments to select one winner. Each give-away is separate, so to be eligible for a specific item you must enter that day's contest on the post where it is listed. Enter today -- good luck! Congratulations to Sigrid Clack, the winner of this giveaway! My Niece is in college in Virginia -- so I decided to put together a "Care Package" for her for Valentine's Day. This is her Valentine. I used the Block Collage Technique for the front panel, and Triple Play Technique for the card. 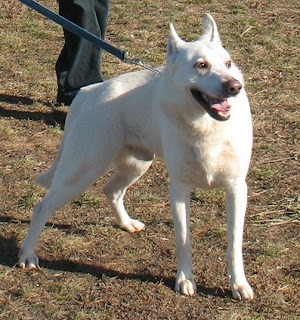 Both techniques can be found in the February 2009 issue of the Technique Junkie Newsletter. Today's Blogger's Challenge was a sketch challenge. Since yesterday was a "creative day" for me, I decided to add this to my (long) list of items to be completed. 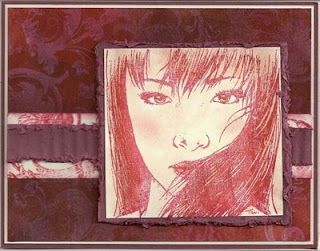 The background on this card uses the Duotone Resist Technique from the February 2009 issue of the Technique Junkie Newsletter. The shade variation is very subtle in the background (and kind of hard to see in the picture, sorry!). Wonderful Wednesday Giveaway - Two Nancys Art Stamps! Today's Wonderful Wednesday Giveaway features a fairly new stamp company called Two Nancy's Art Stamps. I am so excited to have Two Nancy's as both a Technique Junkie sponsor and as a giveaway sponsor! I think that the stamp lineup from this company is just amazing. Take a moment today to see what Two Nancy's has to offer -- you will truly be delighted. Not only that, but all orders using this code: twonancysTJ9/6 will receive 10% off! Today's giveaway is for the card on the right, along with the Designing Woman set, shown above. 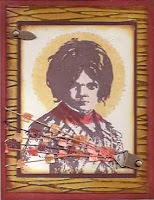 The card uses the Pierced spotlight technique from the new February 2009 issue of the Technique Junkie Newsletter, and is set on a cuttlebugged background. To enter the give away for today, simply leave a comment on this blog entry telling me that you would like to enter by 11:59pm EST on Sunday, February 8th. No other entry methods will be included in the give away. If you email me to enter, your entry will NOT be considered a valid entry. When you leave the comment, make sure to put your NAME in the comment -- if you enter your comment as "Anonymous", I cannot give you the prize! Blogger does NOT record your email address for me, so you will need to check back to find out if you have won or include your email address in your comment so that I can notify you. A good way to do this is like so: phuntoon at optonline dot net -- it will help protect your privacy! I will have a random number generator pick one number from the comments to select one winner. Each give-away is separate, so to be eligible for a specific item you must enter that day's contest on the post where it is listed. Enter today -- good luck! The winner of these stamps is Jane Warnick! Congratulations, Jane!